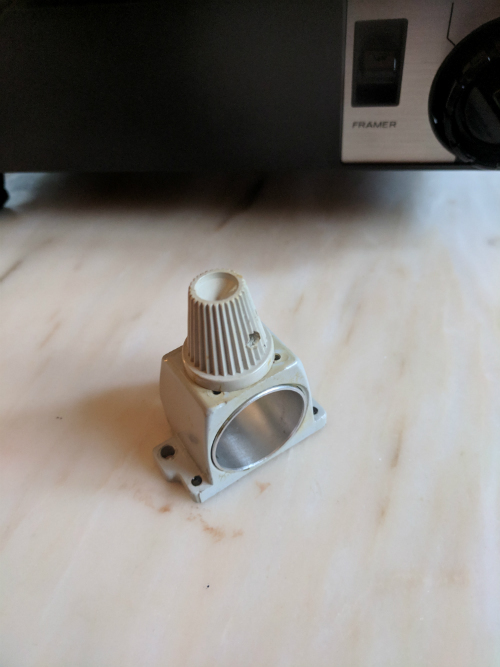 8mm Forum: My Sankyo Dualux 2000H revisited! 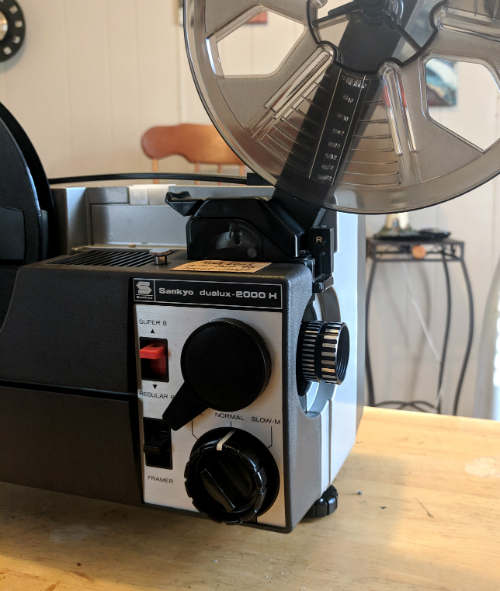 » 8mm Forum » 8mm Forum » My Sankyo Dualux 2000H revisited! Author Topic: My Sankyo Dualux 2000H revisited! A few weeks ago I posted a thread about recently buying a Sankyo Dualux 2000H, and not being happy with the standard lens that is included. So last night I decided to revisit the machine with an idea. I have several Bolex hi-fi 1.3 lenses sitting around the house not being used. One particular one is a bolex zoom lens that has always given good results. Here's what I did! 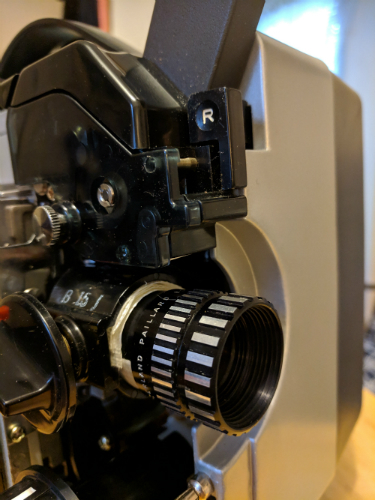 I took several strips of vinyl adhesive style tape and put them inside the lens barrel on the Sanyko. I then added a piece to the bottom of the Bolex zoom lens. I kept doing this until the lens was able to slide in and out of the barrel. Too my surprise this actually worked. Holy cow the projected image is amazing! The original Sanyko lens is a 1.4 with non-stellar results. The projected image is now brighter and this helps with a 100 watt bulb. This might just be my new go to deck! What a transformation! The only drawback is I can't use the original focus knob, but I am able to focus the lens by hand. Actually I prefer focusing this way, as it seems easier to dial in the lens versus the slopping focus knob found on many machines. Well done that man! I have a Bolex 18-9 fitted with a Hi-Fi 1.1 lens. Guess what I'll be doing with my Sankyo 2000Hs this weekend. Janice I'll try to take some photos when I'm off from work Sunday or Monday! 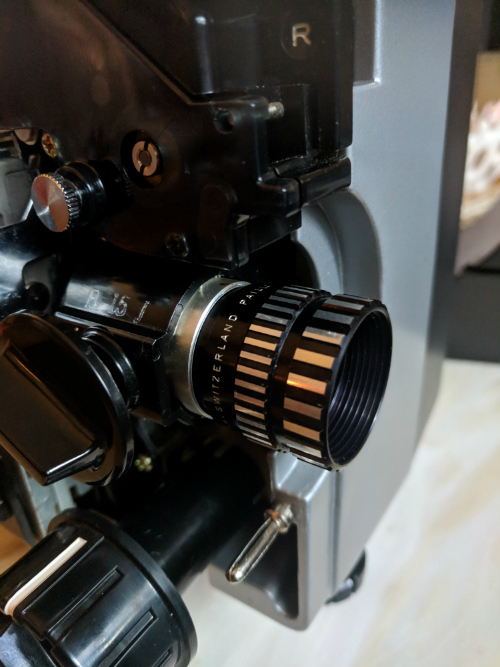 I couldn't fit a Bolex Hi-Fi 1.1 lens to my Sankyo 2000H sadly. The latter's barrel diameter is some 6mm narrower. Utters Anglo-Saxon word to express frustration. Good job! I also have a Sankyo 2000H, and I'm really interested on how your Bolex lens conversion is done. 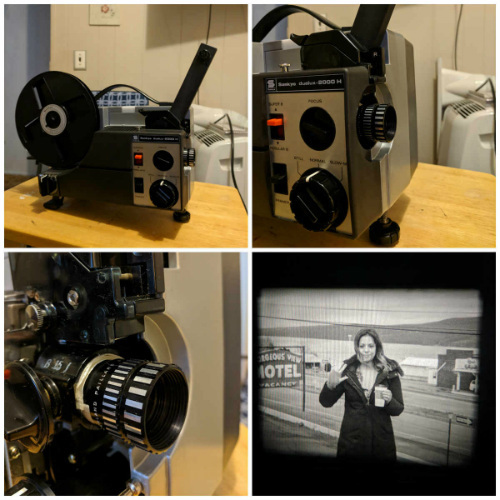 Suggestion - I would love to see a pair of comparison sample videos (Sankyo 1.4 vs the Bolex 1.3). I know it's too late for that because you've already modified the lens tube, but that would have been great to see. 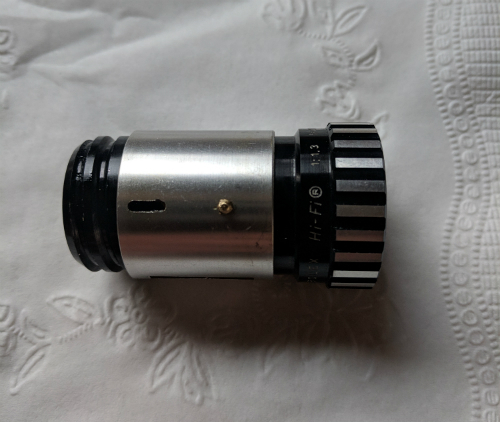 Is there such a thing as a 1.2 projector lens that may fit (with mods) in the Sankyo? Just wondering. Will I'm sorry to hear the conversation didn't work for you. What I should have added was this only works with the lenses from the first series bolex 18-5 projectors. Those first machines had smaller diameter barrels which will slide into the barrel of the Sanyko. Of course my conversation included the addition of the vinyl tape to fill in the gaps between barrel and lens. What we need for this hobby is someone who could fashion different sizes and styles of lens barrels using a 3D printer. The possibilities would be endless. 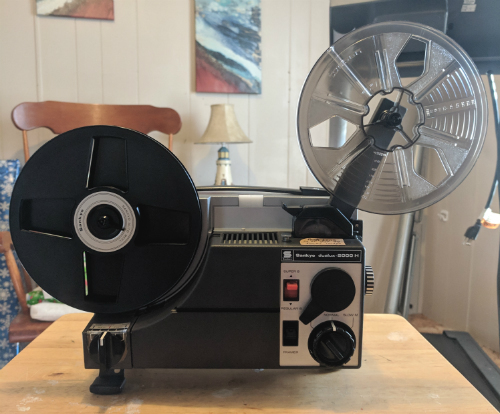 I imagine you could design a smaller barrel by using the original barrel from your projector. The 3D printer could copy the specs of the original barrel but the conversation would basically be a smaller or larger barrel itself. I think I'm explaining this correctly. In another words no barrel adapters but a barrel that would mount the same as the original. Here's some photos as promised. You have some good ideas, Shane. Sounds like someone that had a mini machine shop that could make some mock ups of lens/tubes would be a pretty popular person! It would also be useful to have the dimensions of various projectors and their lenses to determine if lenses are interchangeable with your projector. Kev I agree! I'm pretty sure a 3D printer and some good software would do the trick. Van Eck has parts made this way including a lens adapter. Various adapters and/or upgraded lens barrels made from this printed plastic certainly would work in theory. The lens barrel is plastic on my Sanyko, as seems to be the case with many other machines. The original idea I had for using adhesive tape was not the best solution for this upgrade. So back to the drawling board I went. The upgrade, using a lens barrel from an Elmo FP Series machine. The FP8-C lens barrel fits into the lens barrel of the Sanyko. But before this could work I needed to dismantle the FP's barrel. I was able to use the metal barrel that fits inside the larger barrel one uses to focus the lens. once this was completed, I slid the metal barrel inside the Sankyo's housing, no tape needed. There is a small pin on the Elmo barrel that applies just enough pressure to keep it snug inside the Sankyo's barrel. I then slid the Bolex zoom "hifi" 1.3 lens inside the Elmo barrel. Focus is still made by sliding the lens in or out by hand. This upgrade allows for a better fit/alignment, and I feel focusing is also improved. I also upgraded the bulb to a Osram EFP XENOPHOT HLX 100W for improved brightness. See photos below for parts used, and finished result! Shane, I look forward to your new book, "Hacking the Sankyo Dualux 2000H projector"! LOL, Kev that is funny.... Maybe I could write a coffee table book with that title on the cover. A how-to guide for upgrades or hacks for the Sankyo 2000! I wonder how many Elmo "FP Series" machines will now sell on eBay for just the lens holder, ha! Then of course, the "early series" Bolex 18-5 regular 8mm machines will probably also sell on eBay for just the lens, LOL. what have I done? You might consider removing the heat sink glass also. It will give you a brighter picture. Janice posted a thread on how to do it on April 27, 2015. Hi Barry, Yes I removed the heat sink glass already, and have noticed a big difference in brightness! My projector had a single solid piece of glass. I originally assumed it would be two piece like Janice's 1000 model but it was not. 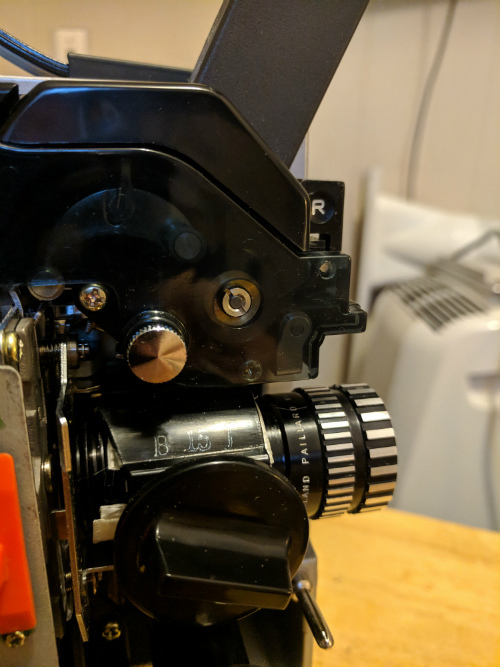 For anyone interested, here's a photo showing how a Bolex "hi-fi" lens fits into the metal Elmo FP-Series barrel. 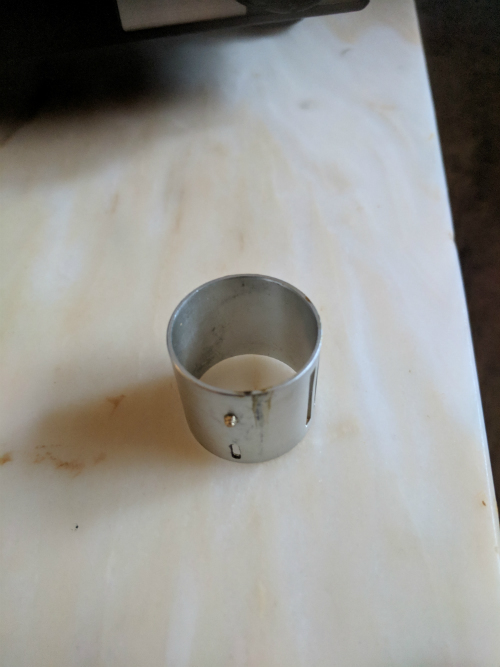 This is a spare metal barrel I had laying around. The lens I'm using in the Sankyo is a Bolex zoom. The one in this example is a non-zoom. As I pointed out earlier the Bolex lens must be from an early 18-5 projector. The early lenses are of metal construction. The later Bolex lenses used in the Super 8 model will not work as the barrel diameter is larger. Shane, thanks for the photo of the Bolex Hi-Fi lens. That gives me a good idea of what I need to buy to replace my current Sankyo lens. Your welcome Kev! Don't forget, in order to make this conversion work, you also need the metal barrel from an Elmo FP Series projector. You could probably find a parts machine online for cheap. My main machine is still a Elmo FP8-C. The Elmo still gives the best and brightest projection. That machine is also fitted with a Bolex "hifi" prime lens.